IN 1999 Karen and Bronagh Mullan from Colinglen were thrilled with the news that they would represent Ireland in Eurosong '99. The girls enjoyed a landslide victory in Dublin after convincingly beating off seven other acts shortlisted as possible Irish entries to the Eurovision Song contest. The duo performed their song 'When you need me' on RTE and a televised vote from the seven areas in Ireland all returned them from the highest possible score. The sisters were set to perform in Israel in what was arguably the best known song contest in the world. 27 teachers in Lisburn Secondary Schools faced the sack in 1985. And the message from a member of the Maintained Schools Committee was "This is only the beginning." Officials from the South Eastern Education and Library Board and the Maintained Schools Committee had lobbied the Department of Education. However, representatives from both bodies, had already conceded the fight. Their aim was to contain the extent of job losses. 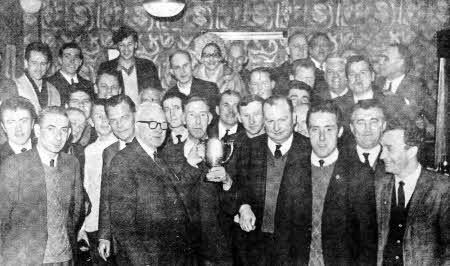 In 1969 members of the Lisburn Legion were celebrating after winning the Belfast and District Billiards League. A Dunmurry marine and aerospace safety and survival equipment manufacturer, RFD Limited, secured contracts worth over £2 million with the world's favourite airline, British Airways, to supply lifejackets and evacuation slides in 1999. In the face of strong competition internationally, RFD, secured a contract with British Airways, to supply approximately 16,500 life jackets a year for three years. The contract was worth just over £1.5 million. RFD also received the first orders to be used onboard the first phase of new Airbus aircraft, which was to join the BA fleet. The airline placed firm orders for 59 Airbus craft in the A320 family, with options reserved and up to another 109. RFD had completed a contract to supply British Airways' flagship fleet of Concorde aircraft with replacement evacuation slides. RFD Managing Director Uel McChesney said: "RFD is proud of its long standing association with British Airways and we are pleased at this opportunity." In 1986 arsonists were blamed for a blaze at a block of flats from which four residents were lucky to escape with their lives. The young people were trapped on the top floor as flames spread rapidly through the stairwell and at one stage considered jumping from a fourth floor window. However, other tenants who had fled flats on lower floors when the fire broke out persuaded them to wait for help. One resident said: "They were terrified and in a really bad state. "They said they were going to jump to the ground but we told them to get something large like a mattress and put it against the door to keep the smoke out and to stay in the flat and wait for the fire brigade. The resident said he had been watching a football match on television when the drama began. "I heard a voice outside the flat and then a bang which could have been the glass in the window going out," he said. "There was a flash and as I have a side door leading from my flat I ran outside. "When I got to the front of the block it was in flames right up the second floor so I ran across the road to a house on the other side. The man met me at the door and told me he had already called the Fire Brigade." Police confirmed they were treating the incident as arson. 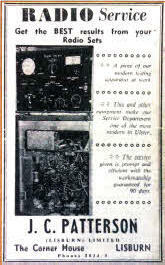 A very special and upmarket radio service was on offer in 1958 in Lisburn by local store JC Patterson. In 1958 Lisburn housewives were hoping to be able to cook their bacon and eggs on Belfast gas. At a meeting of the Gas Committee, a letter from the Lisburn Urban Council asking if supplies of gas could be piped from Belfast, was considered, and the Committee was to investigate the matter. It was understood that expensive repairs would be necessary at the Lisburn Gasworks within a few years. Lisburn Council proposed to pipe gas in bulk from Belfast and store it in the Lisburn gasometer. In 1966 the need for a new police station in the town was stressed by the Mayor Alderman James Howard, at a meeting of Lisburn Borough Council. The meeting heard the existing building in Castle Street was terrible' and the Mayor said the council should do everything possible to help the situation. His comments were made after a planning officer showed possible sites.